When Daniel goes into a debilitating super-heat while delivering a package to the office of one of the wealthiest men in town, he is horrified. It’s not like any other heat he’s had before, and he finds out it could have been caused by some very compatible pheromones. Those of billionaire Cameron Styles. He can’t fathom that Cameron could be interested in a poor, young omega like him, but when he’s asked to move into Cameron’s penthouse condo, he can’t turn down the chance to live out some of his dreams. Cameron has hidden himself away in his penthouse ever since his omega partner was killed in an accident. He has made sure to not come into contact with anyone who might set off his powerful alpha hormones, or touch his heart. Until Daniel walks into his office, that is. After Cameron inhales Daniel’s scent and sees the sweetness in his eyes, he can’t get him out of his mind. But he’s afraid of love and pain, and most of all, of scaring an innocent omega with his depraved desires. Can two people from different backgrounds let go of the pain in their pasts and come together to find the love they’re searching for? As a fan of male pregnancy stories, I was hopeful that His Wildest Dream would hit all my buttons in delivering a nice romance where boy meets boy and make a baby. And, while the novel did hit the right notes in certain areas, there were some elements that were either only lightly touched upon or ignored entirely. The premise is that Daniel, a virgin omega who has had a hard time in life thus far, is working as a bike messenger. On his daily run one morning, he is tasked to hand-deliver an envelope to Cameron Styles, of Styles Investments, in the penthouse of The Marguerite. That kicks off the inevitable meeting between Daniel and his destined alpha, Cameron. Their relationship seems ruled by biology more than shared interests, but it is something that neither can deny. They must be together and there’s no way around it. And what develops is a happily-ever-after story where Cameron rescues Daniel from a bad living situation, sets him up as a live-in nanny for his daughter, Maggie, and they inevitably fall in love, get married, and have a baby together. While the story itself is sweet and follows a relationship that is mostly untroubled, it did feel like more of a surface level story than one where the author wanted to go in-depth into the characters. We know that Cameron feels guilty for the death of his former omega, Gregory, and that Daniel comes from a broken home, with the intent to help others who might be in his same situation, but the exploration of these repercussions of past history was missing. Maggie doesn’t seem affected by her dead father, Daniel seems to take to his destined pairing without reservation, and Cameron’s money solves pretty much any issue that might come up in their lives. Also, there were a few editing issues in terms of word choice, spelling, and punctuation that highlights how the book could have benefited from an editor. One area to keep in mind when picking up His Wildest Dream, if you are looking for a focus on the pregnancy aspect, is that it takes up very little of the book. We have a lot of build-up in solidifying the relationship between Daniel and Cameron, which takes place in quite a whirlwind of two weeks from meeting to marriage, but the pregnancy itself was almost a side note of what must happen next before we move to the subsequent step in their lives. I also remain confused as to the biological construct of this alpha/omega world in terms of pregnancy length, which is shortened in comparison to human gestation since Daniel was only pregnant for five months total. Further information to help the reader understand both this and the societal construct of alpha/beta/omega status would have been helpful. Despite these issues, however, the novel is a happy love story and one that holds the potential for more exploration. 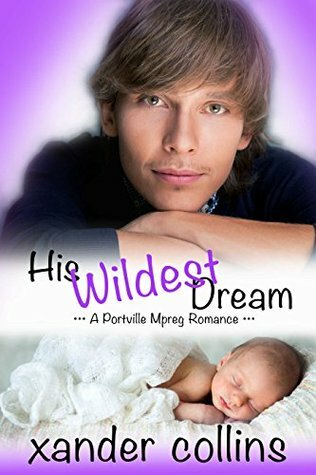 If you’re looking for a fast read with a male pregnancy pay-off, His Wildest Dream is definitely worth picking up. And I do look forward to seeing what the author could do with the male pregnancy concept in other novels. It’s one of my favorite genres, and one that doesn’t get a lot of coverage in quality LGBT fiction, so I support any author who wants to explore it!